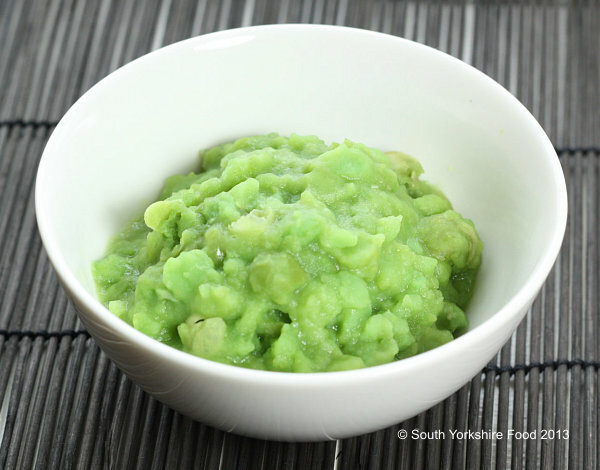 Traditional mushy peas are a Yorkshire food favourite - often referred to as 'Yorkshire Caviare'. Served with fish and chips or with hot pies you have to love their green tastiness! Some upmarket chefs have been found using frozen, and even fresh peas, but to get true mushy peas they have to be made with dried marrow-fat peas which require overnight soaking. Unlike the tinned varieties, these are not luminous green, as they contain no food colouring, so they are a natural grey/green in colour. In Yorkshire mint sauce is also served as a condiment for the peas. Put the peas in a large bowl or pot. The peas will swell and so need plenty of room to expand. Add the bicarbonate and cover with 850ml of boiling water and stir to make sure the bicarbonate has dissolved. Leave to soak overnight, or for a minimum of 12 hours. Drain the peas, then place in a large saucepan, cover again with cold water and bring to the boil. Do not season them at this point otherwise they will go hard. Lower the heat and simmer for approx 30 - 60 minutes or until the peas have softened and turned mushy. Cook until you have the desired consistency - some like them quite 'soupy', whilst others prefer a more lumpy pea. so if you like them lumpy, cook them a bit longer. When cooked, season with salt and pepper to taste and serve hot with fish and chips or a tasty meat and potato pie pie.